CASHEW (Anacardium occidentale) is cultivated widely throughout the tropics for its kernels. 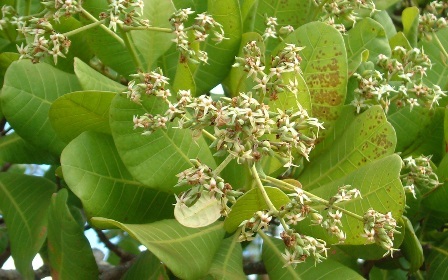 In India, it is grown in the west coast, east coast and a few maidani parts in Karnataka and Madhya Pradesh. The highest productivity is noticed in Maharashtra with 1.5 tonnes/ha. Cashew tolerates wide range of ecological factors. The distribution of cashew is restricted to altitude below 700 m where the temperature does not fall below 20 C for prolonged periods. However, best production is noticed up to the altitude of 400 m with at least 9hr sunlight/day from December-May. 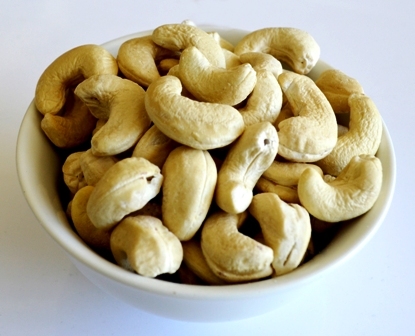 Cashew grows well at reasonably high temperatures and does not tolerate prolonged periods of cold and frost especially during the juvenile period. However, temperature above 36 C is between the flowering and fruiting period could adversely affect the fruit setting and retention. Cashew can adapt very well do dry conditions as it is hardy and drought resistant. However, its varieties perform very well where at least a minimum of 600 mm of rain is received in a year. Prolonged dry spells, frost foggy weather and heavy rains during flowering and initial fruit setting adversely affect fruit set and production. Cashew is very sensitive to water logging and hence heavy clay soils with poor drainage conditions are unsuitable for its cultivation. Excessive alkaline and saline soils also do not support its growth. Otherwise, cashew grows in almost all soil types and performs very well in red sandy loams, laterite soils and coastal sands. Cashew comes up well when the soil pH is in acidic range. More than 8pH is not suitable for its commercial cultivation. 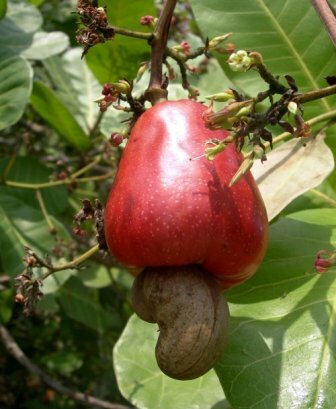 Though cashew is considered to be very hardy and drought resistant, it grows better where water table is high. Cashew also responds well to supplementary irrigation during the summer month (June-March). About 33 varieties of cashew have been released in India so far. Most of them have a mean yield of 8-10kg/tree or 1 tonne/ha. The cashew varieties recommended for different Indian states are given in Table 1. 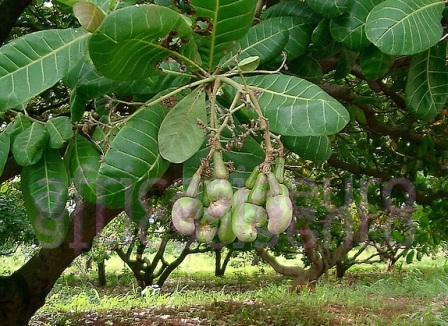 A number of vegetative propagation methods have been tried for multiplication of cashew. Air-layering is easiest methods for its propagation, however, inadequate root system with low number of initial roots, poor field establishment, uprooting of air layers during the cyclone and susceptibility to drought conditions make it unsuitable for commercial multiplication. In mould layering and stooling, absence of tap root is a disadvantage. Considerable success has been reported in epicotyl grafting but due to the poor realization of transplantable grafts and mortality in the nursery due to collar rot has made it commercially unproductive method. Soft wood grafting is most successful and commercially viable technique, giving 70% success rate. It is similar to that of epicotyl grafting, except the age of the rootstock. Planting of soft wood grafts is usually done during monsoon season (July-August) both in the west coast and east coast. Therefore, land preparation such as clearing of bushes and other wild growth, digging of pits for planting should be done during pre-monsoon season (May-July). A spacing of 7.5 m x 7.5 m or 8 m x 8m is recommended for cashew (175 and 156 plants/ha). A closer spacing of 4m x 4m (625 plants/ha) in the beginning and thinning out in stages and thereby maintaining a spacing of 8m x8m by the tenth year can also be followed. This enables higher returns during the initial years and as the trees grow in volume, the final thinning is done. However, in leveled lands it is advantageous to plant the grafts at a spacing of 10m x 5m, accommodating 200 plants/ha. Normally cashew grafts are planted in pits of 60 cm x 60 cm x60 cm size. The size of the pit can be 1m x 1m x 1m if hard laterite substratum occurs in the subsoil. It is preferable to dig the pits at least 15-20 days before planting and expose them to sum so that the termites and ants, if any, which damage the roots of the grafts migrate. The pots should be dug with the onset of monsoon. They should be completely filled with a mixture of top soil, compost (5 kg) or poultry manure (2 kg) and rock phosphate (200 kg) A small drainage channel of the elevated side of the pit is made to divert the rain water to the sides of the pit in sloppy lands, In such areas, it is preferable to plant the grafts along with the contour. At the top of the pit, especially in the sloppy areas, catch pits should be opened across the slope to trap rain water and also to prevent soil erosion. Planting of grafts is done preferably during July-August. Usually, 5-12 months old grafts are used. The soil in the centre of the filled pit is scooped out. The polythene bag of the grafted plant is removed carefully without disturbing the ball of earth. Then the ball of earth is placed in the centre of the pit where the soil is scooped out. It is covered with soil and pressed gently. Care must be taken to see that the graft joint remains at least 5 cm above the ground level at the time of planting. The graft plant should be provided with a stake and tied with a plastic thread immediately after planting to avoid breakage at the graft joint. Star king should be continued during second and third year of planting also. Immediately after planting, the basin around the graft should be mulched with green leaves. This suppresses weed growth and conserves soil moisture. 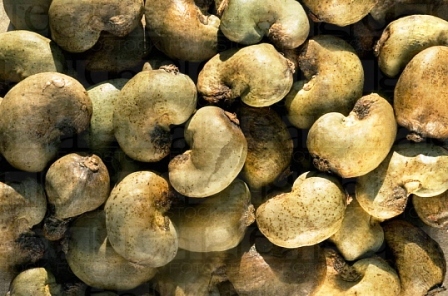 Cashew is commonly grown in slopy lands both in the west and east coast. Soil erosion and leaching of plant nutrients are generally expected under such situations. To overcome this problem, preparing terraces around the plant/tree trunk and opening of catch pits are highly essential. Therefore, cultural operations should be restricted to 1m depth and 2m radius around the trunk of the tree so that the applied nutrients are in the root zone. Before the onset of south west monsoon (May-June), terraces of 1.5 m radius should be made during the second year of planting and this should be widened to 2.0 m during the third the year. Terraces are prepared by removing soil from the elevated portion of slope and it is spread to the lower side and a flat basin of 1.5 m to 2.0 m radius is made depending upon the age of the plant. Terraces may be crescent-shaped with slope of the terrace towards the elevated side of the land, so that the top soil which is washed off from the upper side due to rain water is deposited in the basin of the plant. A catch pit (200 cm long x 30 cm wide x 45 cm deep) across the slope at the peripheral end of the terrace is made for withholding water during pre-monsoon and post-monsoon showers in slopy areas. A small channel connecting catch pit side ways is made to drain out the excess water during rainy season. The sprouts coming from the rootstock portion of the graft (below the graft joint) should be removed frequently during first year of planting. These sprouts usually cause death of the grafted scion and only the rootstock seedlings grow. This operation is absolutely essential during the first year of planting. Initial training and pruning of young plants during first 3-4 years is essential for providing proper shape. The trees are shaped by removing lower branches and water shoots coming from the base during first 3-4 years. Thereafter, little or no pruning is necessary. The plants should be allowed to grow by maintaining a single stem up to 0.75-1.00 m from the ground level. Weak and criss-cross braches can also be removed. Proper staking of plans is required to avoid lodging due to wind during the initial years of planting. After 4-5 years of planting, the main stem may be detopped at a height of 4-5 m from the ground level. Initial training and pruning of its plants facilitates terrace making, weeding, fertilizer application, nut collection and plant protection operations. In older plantations, removal of dried/dead wood, criss-cross branches and water shoots, should be done at least once in 2-3 years. This allows proper growth of the canopy to allow adequate sunlight. 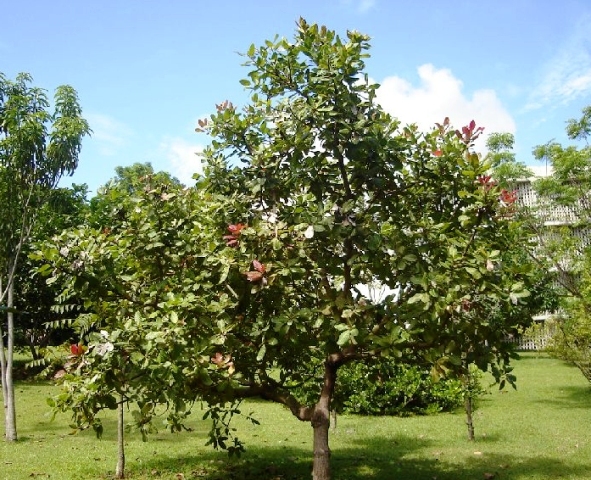 Pruning of cashew plants should be done during August-September. The cut surfaces are smeared with Bordeaux paste. The flower panicles emerging form the graft during first and second year of planting should be removed (deblossoming) the plats are allowed to flower and fruit only from the third year onwards. Fertilizers and manures promote growth of the plant and advance the onset of flowering in young trees. Application of 10-15 kg farmyard manure or compost/plant is beneficial. The current fertilizer recommendation for cashew is 500 g N (1.1kg urea), 125 g P2O5 (625 g rock phosphate) and 125 g K2O (208 g muriate of potash)/plant/year. However, cashew does respond to higher levels of N. The N level can be increased up to 750 g. It is always advisable to use straight fertilizers instead of complex fertilizers which are being marketed. This is mainly due to the fact that recommended doses of NPK for cashew are not available among the complex fertilizers which are marketed now days. The ideal period of fertilizer application is immediately after the cessation of heavy rains. Fertilizers are applied in a circular trench along with the drip zone (periphery of the canopy area). While applying the fertilizers, it should be ensured that adequate moisture is available in soil. The fertilizers should be applied in 2 split doses during pre-monsoon (may-June) and post-monsoon (September-October) periods. However, if single application is to be done, it should be during the post-monsoon season (September-October). One-third, two-thirds and full dose of fertilizers should be applied in the first three years. From then onwards, the full quantity is applied (Table 2). In red loamy soils and in low rainfall areas (east coast), the fertilizers should be applied in circular bands at a distance of 0.5 m, 0.7 m, 1.0 m and 1.5 m away from the trunk during first, second, third and fourth year onwards of planting respectively. The fertilizer is raked into the soil. In laterite soils of sloppy land in heavy rainfall areas (west coast), the fertilizers should be applied in circular trenches of 25 cm width and 15 cm prepared at a distance of 0.5 m, 0.7 m, 1.0 m and 1.5 m away from the trunk during the first, second, third and fourth year onwards of planting respectively. The trenches should be closed immediately after the fertilizer application. Preferably apple mulch of green leaves for enhancing the fertilizer-use efficiency. Cashew is grown under rain fed conditions. However in homestead gardens, supplementary irrigation during summers (January-March) at fortnightly intervals @ 200 litres/plant doubles the yield. In sandy soils, its plants are watered during summers after the north-east monsoon. The frequency and quantity of irrigation varies. Its plants do not withstand water stagnation. Therefore, a proper drainage in cashew orchards as well as in homestead gardens is essential. Horse gram, cowpea, groundnut, e t c. are grown in the interspaces. Casuarinas are another tree crop planted at 1.5 m x 1.5 m spacing along with cashew. Crop combination of cashew, Casuarinas and coconut is popular. Cultivating pineapple as a biennial fruit crop gives an economic return during first 4-5 years. Growing it in trenches in interspaces across the slope is very much feasible and more profitable than growing tapioca and red gram. Growing perennial trees-Casuarinas, acacia and subabul-as intercrops up to fifth year is also recommended. Leguminous cover enriches soil with the plant nutrients and adds organic matter, prevents soil erosion and conserves moisture. The seeds of these cover crop may be sown in the beginning of rainy season. Prepare seed beds of 30 cm x 30 cm size in inter space in sloppy degraded soils by loosening soil and mixing a little quantity of compost. The seeds of these crops are sown in beds and covered with a thin layer of soil. The seeds should be soaked in water for 6 hr before sowing. Since cashew is often planted in areas which are totally dry and unsuitable for cultivating any plantation crop, the availability of moisture is very low. Therefore, mulching is necessary to conserve soil moisture for a long period. The basins of cashew plants are mulched either with green leaves or dry leaves soon after planting. The green matter obtained during weeding may also be utilized for mulching. Careful weeding-clearing the area within 2 m radius of the trunk and slashing the remainder-is essential until the trees shade out most of the weeds. Clearing of weeds is carried out twice a year. The first found of weeding may be done before the start of heavy rains by uprooting the weeds within the radius of 2 m from the main stem and the remaining weeds in the interspaces are slashed to ground level. The second round of weeding may be done during November-December to Facilitate spraying, harvesting and picking of nuts. Alternatively, wherever labour is very costly, weedicides may be applied 15-20 days after a slashing. Well before the start of heavy rains. Initially Agrodar-96 (2, 4-D) @ 4 ml/litre water and subsequently Gramoxone @ 5 ml/litre water is sprayed. Approximately 400 litres solution is required for covering 1 ha crop. The same spraying is done once again in the post-monsoon season. Cashew plants start bearing 3 years after planting. They provide full yield by tenth year and continue giving remunerative yields for a further periods of 20 years. Cashew nuts are harvested during February-May. Only fully mature nuts should be harvested. Usually, the nuts are picked after they fall off from the trees. Best quality nuts are obtained where freshly fallen fruits are collected. The apples are removed and the nuts are sun-dried for 2-3 days to reduce moisture from 25% to below 9%. With proper drying, the kernels retain their quality, particularly the flavour. However, if cashew apples are used for processing, it is better to harvest them from the trees without damaging the apples. The mature nuts sink in water while the immature/unfilled ones float. This test could be used to find out whether the nuts are mature or not. The nuts should be collected at weekly interval in the season. Ripe apples for fresh use should be picked almost daily. The area under trees should be weed-free and swept clean to facilitate nut collection. On an average, a tree provides 2 kg nuts at the age of 3-5 years, 4 kg (6-10 years) to 5-10 kg at 11-15 years and more than 10 kg at 16-20 years.